He can promulgate an ordinance only when both the Houses of Parliament are not in session or when either Lok Sabha or Rajya Sabha is not in session. An ordinance can also be promulgated by the president when only one House is in session because a law can be passed by both Lok Sabha and Rajya Sabha and not one of them. Governor - He can promulgate an ordinance only when the legislative assembly (in case of a unicameral legislature) is not in session or (in case of SLA&SLC) when both the Houses of the state legislature are not in session or when either of the two Houses of the state legislature is not in session. The later provision implies that an ordinance can be promulgated by the governor when only one House (in case of SLA&SLC) is in session because a law can be passed by both the Houses and not by one House alone. # President - He can promulgate an ordinance only when he is satisfied that circumstances exist which render it necessary for him to take immediate action which is basically the satisfaction of the Centre's Council of Ministers. Governor - He can promulgate an ordinance only when he is satisfied that circumstances exist which render it necessary for him to take immediate action which is basically the satisfaction of the State's Council of Ministers. 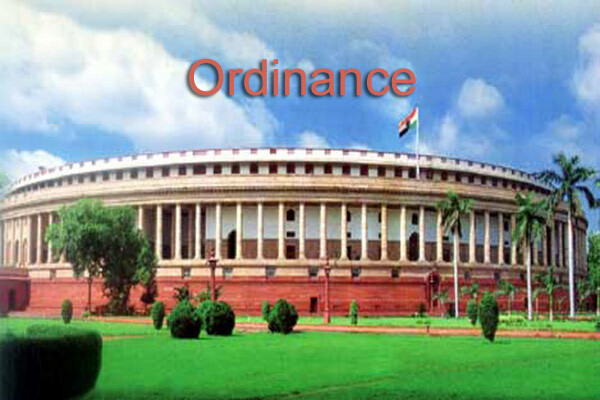 # President - His ordinance-making power is similar to the legislative power of the Parliament. This means that he can issue ordinances only on those subjects on which the Parliament can make laws. Governor - His ordinance-making power is similar to the legislative power of the state legislature. This means that he can issue ordinances only on those subjects on which the state legislature can make laws. # President - Ordinance issued by him cannot make those provisions which Parliament is not empowered to do that is the limitations on the Parliament's power are also the limitations of the ordinance. Governor - Ordinance issued by him cannot make those provisions which State Legislative Assembly or SLA&SLC are not empowered to do that is the limitations on the SLA&SLC are also the limitations of the ordinance. # Ordinance Making Power of the President and Governor is not their discretionary power and can be exercised only on the advice of the Centre's and State's Council of Ministers. Both President and Governor can withdraw ordinance at any time as it is instructed to them by the Centre's and State's Council of Ministers. # President - An ordinance issued by him should be laid before both the Houses of Parliament when it reassembles. The ordinance passed the President ceases to operate on the expiry of six weeks from the reassembly of Parliament. It may cease to operate even earlier than the prescribed six weeks, if both the Houses of Parliament passes resolutions disapproving it. Governor - An ordinance issued by him should be laid before the legislative assembly or both the Houses of the state legislature (in case of SLA&SLC) when it reassembles. This Ordinance issued by the Governor ceases to operate on the expiry of six weeks from the reassembly of the state legislature. It may cease to operate even earlier than the prescribed six weeks, if a resolution disapproving it is passed by the legislative assembly and is agreed to by the legislative council (in case of a bicameral legislature). 1. If a bill containing the same provisions would have required the previous sanction of the President for its introduction into the state legislature. 2. If he would have deemed it necessary to reserve a bill containing the same provisions for the consideration of the President. 3. If an act of the state legislature containing the same provisions would have been invalid without receiving the President’s assent. # Presidential Ordinance can never be promulgated to amend the Indian Constitution.